Every year we the boys to see the jolly man in the big red suit at Bass Pro Shop, one of our annual Christmastime traditions. 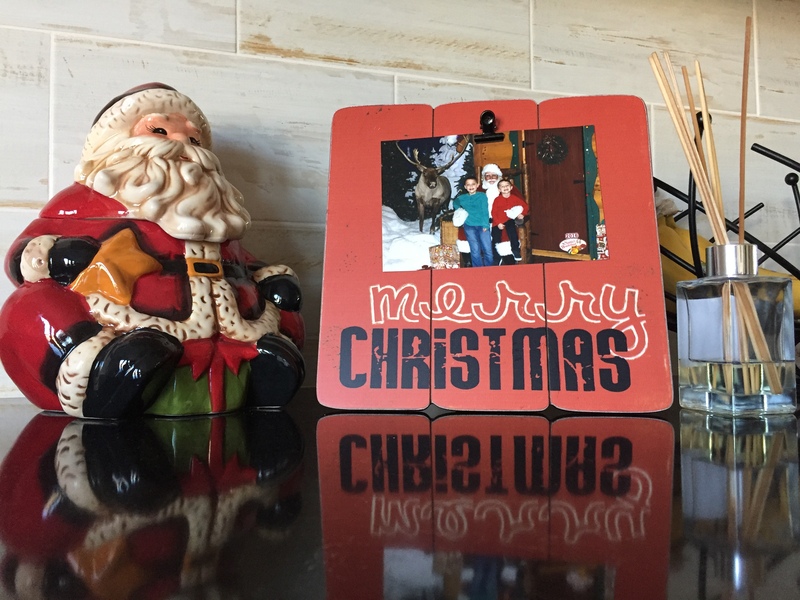 Throughout our house you will find several ‘tips of the hat’ to Santa Claus, from ornaments and decorations to half a drawer of our entertainment center devoted to fun Christmas movies about good old St. Nick. Elf. The Santa Clause (1, 2 & 3). Fred Claus. Jingle All the Way. All Christmas staples in our home. On our bedposts hang ‘his and hers’ santa hats, with Mickey Mouse ears affixed to them from our honeymoon. I wouldn’t call us ‘Santa crazy’, but we certainly appreciate his role in Christmastime celebrations. With all of that said, we must warn you, there is chance our children could ruin Christmas for someone, somewhere down the line. 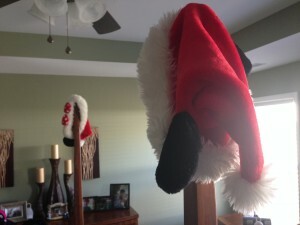 Because as a family, we have chosen not to participate in the Santa deception. Our children are not out to destroy Christmas dreams, nor or we. We all know when to speak, and more importantly when to remain silent. We know how to push the conversation back to the family. But we also try to walk the line of truth as imperfect as we all are, and sometimes that has to be spoken. As our boys sat on the mall Santa’s lap, they smiled and hugged him, and they even told him what they were asking for this Christmas. But they know the truth because we reinforce it in them. We have taught them about St. Nicholas, and we have shared with them the ‘fun’ that can be had with the modern day Santa. But we don’t celebrate him, and we don’t lie about him. Fantasy is fun. There is a reason we are Disney fans, they execute fantasy unlike any other. But fantasy is not reality. It just is not. So we have chosen to teach our children the reality of Santa Claus, the Easter Bunny, and the Tooth Fairy; from the very beginning. I know right there several of you just put up your fists to fight, I can’t believe he just said that. Please know I am not saying writing this with a voice of judgement, rather with a voice of conversation. You don’t have to fight me on it, and you don’t have to be embarrassed around me based on how your family handles Santa…just like I don’t want to be embarrassed around you in my own misgivings. However as I contemplate Hebrews 10:24, to me this is just another topic for which I hope to provoke others to good. Some of us have never even ‘considered’ what I am about to say. We have heard it said many times that making Santa a reality is not deceiving, it is playing. Pretending. When you pretend, you have a sense of reality but are playing ‘otherwise’. When we ‘play’ or ‘pretend’ we are cops and robbers we don’t actually think we are. When you deceive, you are creating an intentional twist of reality. For many children around the world Santa is a deception because parents have set him up as that. They go through great lengths to be sure their children believe Santa is real. They know that their children are accepting what they are told as a truth. The parents may be pretending, but children aren’t. They are hanging on every word their Mommy and Daddy tell them; because their Mommy and Daddy would never lie to them. They are being innocently deceived and that is a dangerous game to play. When I pretend with my boys, they know the differences between reality and play. Pretending is knowing reality and acting contrary to it. So for us, to pretend, is to also know the truth. Consider this. Children grow up being taught that Santa is real, the Easter Bunny is real, the Tooth Fairy is real, and God is real. As they grow, they discover that Santa is not real. They learn the Easter Bunny was made up. They find out the Tooth Fairy was Mom and Dad. Then why would God be true? If three of the four figures they grew up believing in are disproved, why would the fourth be real? If they were lied to about three of the four, why should they think the fourth was true anymore. Don’t worry, I hear you now. You were taught Santa was real, and that did not affect your perception of God when you learned he wasn’t. But I also didn’t go on a crime spree because of the sometimes violent video games I played as a child…but other children have. Just because we weren’t affected by that, doesn’t mean that other volatile, trusting children won’t be. What if I told you I had this awesome friend that I wanted you to know. He was a billionaire, he had a yacht, and he was the most philanthropic person you ever met. I told you that he was out looking for people in need, and he knows you have some dire needs in your life. He wants to help you meet all of your needs and be sure you are taken care of. What if I strung you along on that, making you jump through hoops and ‘perform’ to meet his favor and receive gifts. Then, after stringing you along for a while I told you, oh I was just pretending! He isn’t real, I thought you were playing with me? You would call me a liar, wouldn’t you? It is sick, isn’t it? Yet, we feel we can do just that with our children. It is as if everything that scripture says about honesty (Proverbs 12:19, Zechariah 8:16, Psalm 5:6, Colossians 3:9-10, Proverbs 12:22…and on) only apply to cognitive adults, not children. It has become okay to deceive to children because it is easy. Maybe it is a small lie about what you are feeding them. Or a lie about where you are going or what you are doing. Or a lie about ‘being in the shower’ when someone calls for you. Or a lie about an altered reality. Santa. It makes an incredible tough job (parenting) a little easier, sure. We have chosen not to lie, no matter the circumstance, to our children. Have we had to answer some really hard questions? YOU BETTER BELIEVE IT. Have we been put in some very awkward situations? UH, YEAH. But as followers of Christ, we choose truth…even with our children. So we will continue to enjoy the Christmas season. We will continue to watch our Santa movies and continue to get our picture with the shopping mall Santa. But we will also continue to speak truth in every area of or children’s lives. We will also continue to let our children see that their mommy and daddy give them good gifts because we love them, not that Santa gives them good gifts because they ‘performed’ all year. That is a whole other conversation though! We aren’t telling our children to run around and spoil Santa. They know how others may handle Santa. But we are teaching them honesty, and if that comes out…then we are proud of them for walking in truth. I hope this doesn’t mean that you have to keep your kiddos away from the Froman kiddos. Merry Christmas friends, as we celebrate the gift of Christ!